I used my natural body type to play football in high school and was venturing on to collegiate sports when an injury kept me from being able to compete. I was always a bigger kid, but I found myself maintaining the eating habits of a defensive lineman without all the work. Walking up a couple flights of stairs in 2010, I noticed that it was unhealthy carrying around all the extra weight and it was having less than desirable effects. So I started on this journey to rediscover health and fitness, one step at a time. Yards became blocks, blocks became a mile, and miles became easier. What started as a way to lose weight transformed into something bigger. I began to meditate and grew more in tune with my body as I ran. I enjoyed the primal feeling when pushed to the top of a hill or ran an all-out mile. I tapped into that unfettered inner animal that we all are, transcending the effort and using it to better understand who I am. It was this mental aspect of running than explains why I gravitated towards trails. The push into ultra distances was really just an excuse to extend those experiences. I started focusing on trail running in 2013 and hopped right into Leadville. I ran the race extremely conservatively, not knowing how my body would react. In the course of the experience, I fell in love, not only with the distance, but also with the culture of our unique ultra community. I dedicated 2014 to learning how to run 100’s and racied anything and everything I could in between the longer events so that I could get things dialed in. 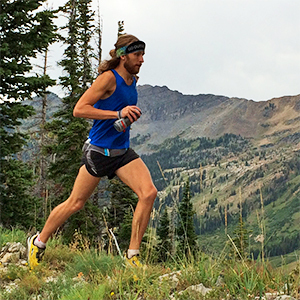 I was introduced to VFUEL when I signed with Team Altra Footwear. My nutrition needed help and VFUEL is the only gel I found that works for me time after time. It fueled my first 100-mile win at Bryce Canyon 100 and then a quick turnaround-win at the Ouray 100. I never had a better running year and I know VFUEL played an integral part of that. Other Hobbies: I love being outside. Period. But when I’m not doing that I enjoy cooking quite a bit. Best thing about VFuel: It’s the ONLY endurance fuel that can keep me going during the long run and stays down each time. The flavors are pretty damn good. Best recovery meal: Bacon Avocado Cheeseburger and Fries… smothered in ketchup, but no tomatoes.